The Kedron Brook Catchment, including the Cedar Creek tributary, contains significant assets and opportunities for the conservation of biodiversity and water quality values within the catchment and wider landscape in general. Hi, I’m Gail and live at The Gap/Upper Kedron. I found out about the grant when I received a letter from the Wildlife Preservation Society of Queensland that identified my property as having particular species of native flora. I thought this was a great opportunity to control some of the lantana problem I have on my property and to encourage the natural growth of the native flora. The funding I have been given will help revegetate an area of my property which was cleared prior to my purchase of the property 26 years ago. About 24 years ago, I selectively cleared my property and planted a combination of grasses suitable for my angora goat stud. Since the sale of the animals some 19 years ago, sections of the property have become over-grown with weeds. 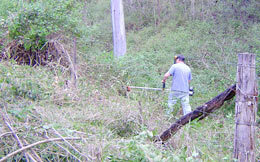 The grant will also help control the lantana which has grown where the clearing took place. I have already undertaken some removal of the lantana which is no easy feat. I also recently attended the Managing Fire and Native Vegetation on your Property Workshop which was held for recipients of the grant. I thoroughly enjoyed it and found it most interesting, learning about the different strategies of managing the fire risk which many of us who live on large blocks are of potentially risk. In fact during my time living here, my property has been affected by three fires caused by careless human factor. The most recent fire about two years ago was significant, lasting for several days and was as close as my clothes line. Through the education of the workshop, I understand fires better and the need for a property fire plan. The workshop was also great as it provided the opportunity to meet other like-minded people in our community. I would definitely be interested in attending other workshops. This grant has afforded me a wonderful opportunity to practice weed control, revegetate, to be further educated, and given me the motivation to carry it out. Thank you to everyone who is helping us with landcare. The Restoring Corridors Project aims to provide support to landholders and community groups within this area to implement land management activities that support the protection and conservation of these values. Kedron Brook Catchment Branch was the recipient of a grant in late 2007 from SEQ Catchments that has enabled the branch to provide advice and financial assistance to landholders and community groups. 150 expressions of interest were received and 29 were approved for funding. Establish and support an informal network of lands under management for nature conservation outcomes. Implement weed management strategies in areas of bio-diversity significance within the Kedron Brook Catchment. Improve the condition of existing riparian vegetation in the Kedron Brook Catchment via weed management. Restore riparian vegetation in strategic locations in the upper catchment where there is none. Improve the stability of waterway banks within the Kedron Brook Catchment through the maintenance and restoration of bank vegetation. Improve waterway condition through the management of livestock access to the waterway corridor. To date, nearly all funds allocated to landholders have been used for erosion control, weed control and revegetation of locally native species. Overall the project has been very successful; however, there have certainly been challenges along the way, namely the storms and heavy rains of late 2008 and May 2009, bush turkeys, and changing Catchment Coordinators (or Creek Rangers). On top of the project goal of restorting ecological corridors in the upper catchment, the project has also had the exciting outcome of increasing landholder interest in, connection with, and knowledge of their bushland backyards. Many landowers are committed to ensuring the ongoing protection and enhancement of the bushland on their properties, especially along waterways. The Kedron Brook Catchment Branch is pursuing different options to extend the project for a second round, hopefully perhaps in 2012. If the Branch is successful, funding would become available to relevant landholders in the planned areas. This event would be be communicated on this web site, through our newsletter and through direct contact with people that have previously expressed their interest.